In a large bowl throughly mix together all of the ingredients without mushing up the corn. Heat the oil in a large pan, and drop 1/4 cup dollops of the batter on the oil. Fry until golden brown, about 2 minutes per side. Drain on paper towel lined plates and serve immediately. 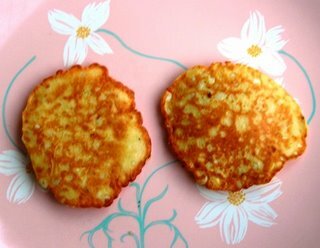 When I brought home 24 ears of corn from the farm stand I knew it was time to make fritters. I had never made them before but they are really easy, sort of like making blueberry pancakes but with corn. I decided to use half cornmeal half flour for extra corn goodness, but you could also just use flour. My favorite part is how the corn stays sweet and crisp and is a perfect foil to the almost fluffy batter.